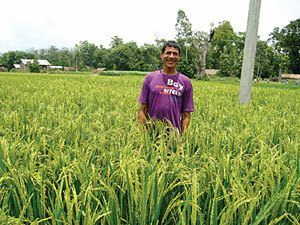 HAPPY FARMERS: Lalku Katharia proudly shows the bumper harvest of rice in his farm. It sounds too good to be true. 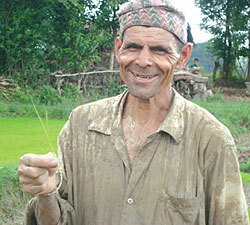 Lalku Katharia, a farmer in Lalbojhi of Kailali has doubled his rice harvest from half the seeds he used last year. He did this without even needing to flood his fields with scarce irrigation water. Lalku and other farmers in western Nepal are taking part in trials of a new technique called SRI (System of Rice Intensification) which have been shown to increase rice production by more than double with fewer seeds and fertilisers, even in arid areas. It seems to be ideal solution to a food-deficit country dependent on rain-fed agriculture. "Look, I didn't have to flood my field, and there are 100 tillers from a single seedling," says Lalku, showing us his rice patch, "earlier I used to get only 10 tillers each." SRI also produces sturdier plants with thicker tufts that can withstand floods. 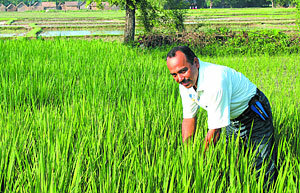 Bedanand Upadhay shows a rice seeding he is ready to transplant. Some government officials and the UN's Food and Agriculture Organisation are enthusiastic with the trials and say SRI could hold answer to Nepal's food insecurity. A timely monsoon and the winter rains boosted harvests, and Nepal recorded a grain surplus of 111,000 tons this year. However, 38 districts still face food shortages and 41 per cent of the country's population is undernourished. The country needs to feed more with less and SRI seems to be one answer. Lalku is now getting his second harvest from SRI just before the monsoon floods can damage crops. Crops in this part of Kailali are prone to annual floods from the Mohana river, and has not seen a good harvest in five years. SRI is perfect for these places as it does not require much water and rice can be planted early on in the dry months when flooding is not a problem . A few hours away in Ramshikarjhula, Bedanand Upadhyay doubled his rice harvest this year. Thrilled with his success, he is now planning to expand SRI to the rest of his farm. "I could not believe my eyes. I had never produced so much with so little," he says. The word has spread and Bedanand is now training neighbouring farms in SRI. In Dakshin Purba VDC, 24 farmers this year converted to SRI with assistance from FAO. Farmers are trained in the technique right from the transplanting to harvest in field schools over a period of 16 weeks. "Where irrigation is available, SRI can be done pre-moonson, allowing farmers to harvest at least one rice crop before the rains, increasing their food security," explains Xavier Bouan of FAO. However, while farmers across the Tarai don't need much convincing about SRI, the government in Kathmandu is more reluctant. The National Agriculture Research Council (NARC) is still not backing SRI as government policy. "It is surprising why the government is not supporting SRI," says Bijay Mallik, Director General of Department of Agriculture. "But we are not waiting for NARC and are holding SRI demonstrations in all rice growing districts so that farmers can adopt the technique themselves." With all the advantages it offers, SRI is quite simple, and can be done on local or hybrid varieties alike. Instead of waiting for the seedlings to mature, young plants of 8-10 days are transplanted one by one, allowing the roots to spread out further. They are also planted farther apart, at 20 cms, so that seeds don't have to compete for food and light and this also reduces the amount of seed required. 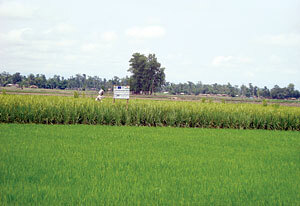 The difference of old rice and new rice transplanted at the same time is apparent in paddy fields of Dakhsin Purwa VDC, Kailali (pictured, right). The patch in the foreground uses the old method, and the one behind uses the System of Rice Intensification (SRI). The field is irrigated just enough, without submerging it in water and water is drained two-three times at an interval of 15 days. This allows bacteria in the soil to improve fertility. A weeder machine and composting means less pesticides and fertilizers are needed. Traditional paddy-growing submerges fields to control weeds and pests, and the downside of SRI is that it is more labour intensive, requiring more hands for weeding, timely drainage and careful planting. But the benefits in greater harvests far outweigh these shortcomings. SRI produces 150 quintals of rice per hectare for a land that yielded 20 to 30 quintals in the old method, using 35 per cent less water, 10 per cent of seed and 50 per cent less fertilisers. System of Rice Intensification (SRI) was invented by French Jesuit Fr Henri de Laulanie in Madagascar in 1983 after 30 years of research. Today it is used in 30 countries including China, Indonesia, India, Sri Lanka, Laos and Cambodia, where research has shown yield increase by 30-50 per cent using half the amount of water. China in particular, is leading the way, using SRI in conjunction with hybrid seeds. India has adopted SRI as one of the components of its food security program and is promoting the method in 39 districts and is planning to convert 5 million hectares of land into SRI plots in the next five years. In Nepal, SRI was pioneered by Rajendra Uprety (pictured) when he was District Agriculture Extension Officer in Morang. He read about it in an agriculture journal and decided to give it a try. Today there are SRI tests and demonstrations being carried out in 35 districts across the country: 300 ha in Dang, 120 ha in Jhapa and 80 ha in Kailali. Test plots like these produce up to 12 tons per hectare, compared to 3 to 5 tons produced by the old method. A really uplifting and hopeful story. Thank you Nepali Times for casting your eyes beyond the Kathmandu Khaldo to Kailali and Rukum in search of stories of how resilient and hard-working Nepalese people are. Rajendra Upreti deserves a presidential medal of honour, and hopefully the govenrment will take this technology to a larger public. Seeing how Nepali Times, especially Rubeena's columns, are spearheaded to focus on the topical issues of the country, I felt nostalgic and wothy of being a regular Nepali Times reader. Foremost, Agriculture constitutes almost 60% of Nepali population, and it contributes at least 35% of the GDP in aggregate sum. Paddy, wheat, barley, maize, oat,etc. are the crops that need such improvised, lab-tested seeds because it is the policy next neighborhood, not ideology far away. Sounding out these experts is so much fruition. After all, knowldge is the main thing for we kailalians(!) to get out of thir continual swamp of low agri-productivity. I know what is it to be a tired ropar in the monsoon. You have sapling, and first you plow the field hard. Then, you have to maintain the field with irrigation, manure, pesticides; and then with songs sang, you have to crop the fieldwith hopes in hand. Then when it grows and dhanko bali sprouts, it's happiness as well a further hope. It's the triumph of Nepolean, no less. Thanks to pioneering people like Rajendra Uprety, such record-breaking agricultural productivity means we'll also double the paddy productions, if Govt. priority aligns with the pioneering institutions. Cannot such seeds be tested for other crops? Now, the plights of farmers must be heard, because our nation's prosperity lies in the prosperity of this middle-class. Otherwise, it just hollows out. Nepali Government may be trying hard to sustain such effords and that's laudable. So Nepali Times is praiseworthy in becoming the voice of farmers, and other rural mass, who in turn, will record its journalistic history with concern and goodwill. SRI is a very very controversial topic. What the author claims as miracle does not come hold true in Nepalese farming for its very very labor intensive and needs complete control of water aside from sensitive handling of rice seedlings which are not usual practice of rice cultivation in Nepal. There needs verification of author's claims by research in large scale. Thanks Rubeena Ji for the SRI story from Kailali. SRI is a ray of hope for food security in Nepal. It needs to scale up allround the country both for spring and rainy season .There are six basic principel of SRI, early seedling, wide spacing, more use of organic fertilizer, good quality seed, alternate drying and wetting of field, use of rotatory weeder. Among them it may be ideal to use all principle in farmers feild. Infact use of all principle of SRI ultimatly increased the rice production by more than 10 times. Even using three two four pricniple of SRI in farmers field increased the yield substantially. This is called partial SRI. According to the field condition partial SRI could be scale up any where at any condition. therefore SRI is not a controversial topic it could be really adopted in large area. In Kailali some farmers have transplanted rice through SRI in more than 3 hac of land. I don't want to make the optimists among you sad. This report only presents opinions from the supporters of SRI. This is not complete picture. SRI is controversial. I have talked to professors in Asia who have experimented with SRI for many consecutive seasons to verify the claims of miracle. They saw no miracle. If SRI is science, what is the explanation for high production? Or is it magic? God's miracle? Where are the scientific results from study done in Nepal? This report is one-sided and only beats the drum of SRI. If this system is so viable, it's better to publish the validated research on scientific journal rather than beating the drum in a newspaper. The writer could do good by referencing them. Dear Agronomist, Thanks for the comments. Did you try SRI or just read or listen comments from some very negative people. How big verification trials/test you want to verify a technology/practices? 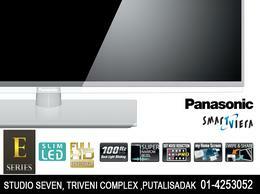 Most of we people try to copy/photocopy any technology ant it wouldn't work everywhere. Most of the time we don't test anything our-self. We just listen some negative comments and pass to other people after add some more. First we need to test, try to verify, re-shape/re-adjust technology according to out situation then try to pass other. I work on SRI same way for last 8 years and visited hundreds of SRI fields in different districts. I have seen hundreds of SRI fields size from some hundreds square meters to 2 hectares. In your opinion how big fields we need/demonstrate to verify SRI??? 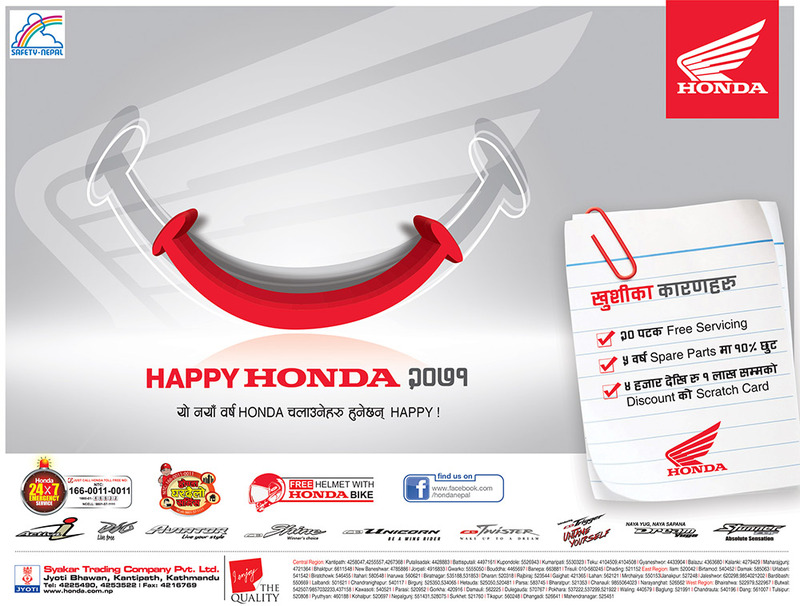 Thank you very much Rubeena and Nepali TIMEs for your contribution. Once reality will be same for all people involve for the agriculture development around the world. Ramji, you can read a lot of papers/articles on SRI published in scientific journals. Following link may be helpful to you..if you really want to know scientific explanation of SRI. It is neither magic nor GOD's miracle but reality found on the farmers fields (beyond the boundry of so called research station). #5, #7 What do we say to you? Such is the tragedy of Nepali mindset. So much cynicism and arrogance. SRI has proven itself in hundreds of hectares of land in Nepal. India, Vietnam, China have developed thousands of acres of SRI plots. And these people still need proof. A system like this needs to be encouraged through as many channels as possible. Thanks to Rubeena and Nepali Times for bringing this out on the pubic. As for those who need research articles for proof: have you ever gone out and visited a farmer's field before discrediting SRI? Well go and publish whatever article in whatever reserach journal you wish to. But this is not how rice turns up in your plate. Go and muddy your feet in the fields first. And indulge in criticism. I think the best part about this article is the smile on Bedanand Upadhay's face. Even though this one might be just for the camera- my point is that we won't be a good and successful country unless we can put similar smiles on the face of all farmers. Disrespect to and exploitation of people who do their jobs and grow our food has been the worst thing to happen to our country's modern history. We have become so lazy, we import the buffaloes for our momos, the pickles for our meal and fruits for our festivals. Thanks for such a hopeful and encouraging piece. Here is another concrete proof that successes in Nepal can happen without the "government" in Kathmandu. Another case for fresh local elections. Farmers can govern themselves. They don't need Kathmandu to set "government policy" for them. I am one of those people who comments on the usual political stories. However, I eagerly anticipate and read every piece by Rubeena Mahato. I just come back from Lalbojhi VDC. I saw that many farmers are practising SRI with their own initiative. Some of them who planted rice earlier has been harvesting their SRI rice without worry on the flood. It reflects the acceptance of farmers to this technology. This effort is a promising for many flood prone areas and also to food insecure country like Nepal. Some peoples who do not agree with SRI, I suggest, they need to go to SRI farmers and do not be shame to learn from farmers on how SRI able to improve the rice productivity, if you do not believe this article. Rajendra sir it may major solution of hunger free but i have questions for permanent n suistanable tools , In my openion its next solution is scientific landreform system n suistainable agriculture system?? ?